A podcast is an audio recording available to download or listen to on various platforms and apps. Podcasts are similar to radio in many ways, except they’re pre-recorded and not live. People have been using podcasts to listen and learn about topics varying from true crime to Hallmark movies to economics. 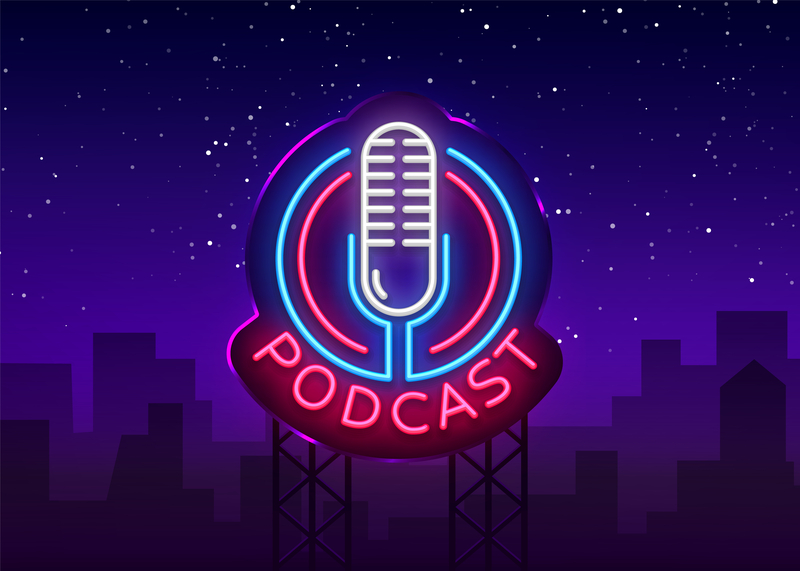 Over the past few years, more and more businesses have started to use them to reach new audiences, and there are numerous statistics to support incorporating podcasts into your marketing strategy. 51% of the US population has listened to a podcast. 27% of US podcast listeners have a 4-year college degree (only 19% of the total US population has one). 49% of podcast listening is done at home and 22% is done while driving. Normally, marketers’ access is limited to audiences on their computers at work. Podcasts enable marketers to speak to people when they’re in their cars or at home doing chores. Additionally, podcasts have the potential to engage greater attention from listeners than emails or blog posts. For example, more often than not, when I do a Google search, I’m looking for a quick answer in the moment. On the other hand, when I listen to a podcast, I’m trying to expand my understanding of a subject that interests me. I don’t have time to just learn about a topic while I’m at work, so I do that at home with a podcast. It is important to keep in mind that the podcast field is getting diluted — there’s a podcast for everything at this point — but if you can stand out and provide value for your listeners, then this medium can still help your business. How Do You Market Your Business Through Podcasts? In addition to the benefits brought by the extended reach of podcasts, podcasts are also great for marketers because people enjoy doing them. The interviewer needs to do some prep work, but the interviewee typically just receives a couple of questions or conversation topics in advance they need to be able to speak to. As long as they’re an expert on the topic, they shouldn’t need to do that much work to participate. Participating in a podcast is easy. Someone can do a podcast from their house in their pajamas. They don’t need to look presentable, they just need to be able to speak on a topic. That ease of content creation aides marketers in finding new subject matter experts and extending their network of people who can participate in content creation. Building relationships with thought leaders and subject matter experts can add credibility to your brand and allow you to draw on their networks. The first time I heard of Drift’s Dave Gerhardt was on OpenView’s Podcast. That podcast introduced me to Drift, who we’re now partners with, and now I follow Dave Gerhardt. If I see him pop up somewhere else now, I’ll listen to that too. Once you’ve created a podcast, you have at least three content assets from each recording. A 10–30 minute interview can lead to the podcast itself, a related blog post and a downloadable transcript. The blog post can help promote the episode, and the transcript can act as a lead generation tool if you gate it. Blog posts and transcripts can also help with searchability. For example, when I was working on a post on Customer Lifetime Value, I wanted to reference a story I’d heard about Hootsuite reducing their churn. I was able to re-find the podcast episode because the transcript appeared in my search results. If you have a strong presence on Youtube or another social video platform, you can also post your podcasts with a cover image or motion graphics to spread awareness. Ultimately, podcasts can strengthen your marketing strategy by helping you reach new audiences, form relationships with subject matter experts and influencers and establish yourself as a thought leader. How Do You Provide Value Through Podcasts? Your podcasts don’t necessarily need to be completely different from what you’re already doing. If you’re a B2B marketer, you’ve probably already created a webinar, a blog post, a premium content offer, a white paper or any sort of guide. Typically, those pieces of content aren’t created by the subject matter expert themself. For example, I don’t write New Breed’s guides. I provide subject matter expertise where applicable, but the final pieces of content are written and edited by our writers. Podcasts allow audiences to learn directly from a subject matter expert instead of gaining that information through the lens of a writer who’s translating that content into a more readable format. Even when subject matter experts write their own content, they still write differently than they talk, so by presenting the same information through a different format, you’re providing value by adding a new perspective to existing content. This style is where one person hosts the podcast every week and brings guests in to be interviewed from both within and outside of the company. For this format, the content strategy will be dictated by the available interviewees. Once you find a subject matter expert, you allow them to dictate what topic to speak about as long as it doesn’t contradict any of your existing content. In this style, the interviewer guides the conversation and creates cohesiveness from episode to episode while the guests provide new information and outside perspectives. In this podcast style, there are 2–3 people who are always on the podcast talking about different subjects. The content strategy for this style can be driven by areas of expertise, where you agree on topic areas you want to provide information on in a similar way you’d plan out a blog editorial calendar. Or, you can allow your podcast to be documentation where you discuss things like what you’ve been doing lately or what you’ve learned recently. With both styles, you don’t have to reinvent the wheel. You can discuss the same things you already write about on your blog. You’re going to be reaching people who have never heard of you before, and if you happen to gain listeners who also read your blog there’s nothing wrong with that — you’re still providing more value to people who already engage with your brand. How Do You Market Your Podcasts? The people already engaging with your content are the ones who will find the most value in your podcasts. Reach out to your current subscribers to promote your podcast and get people within your company to subscribe and rate your podcast to gain initial reach. Subscriptions and reviews will help your visibility to start off. Plus, not everyone in your company will have helped create your podcast, so internal feedback can help you identify ways to improve it. As more people listen, subscribe and rate, it’ll be easier for people to find your podcasts across hosting platforms. Creating blogs and posting transcripts from your podcasts will help increase visibility from the SEO perspective as well. Additionally, you should have a web page devoted to your podcast on your website and make sure there are a clear CTAs promoting subscriptions. Within your podcast, reference your company at the beginning and end of each episode. Just because people are listening doesn't mean they subscribe, so ask for that every time and reference where else they can find your content. When creating podcast descriptions for other platforms, make sure to mention your company name and what you do so listeners can find their way back to your website. Even if it’s a personal podcast, mentioning where you work can add a trustmark. If you have interviewees, ask them to plug your podcast the same way you’d ask guest bloggers to promote their posts on your site. Their promotion is beneficial for both you and them because it increases your reach and helps their credibility. Because they’re growing in popularity and easy to consume, podcasts are a great way to offer content. Not everyone likes reading and podcasts offer another way people can engage with your brand.